The strain of M. leprae found in the Americas is closest to the European/North African variety (Monot et al). Researchers therefore suggest that colonialism and emigration from the old world most probably contributed to the introduction of leprosy into the new world. For instance, in the 18th and 19th centuries, when Scandinavian immigrants settled in the Midwest, there were many cases of leprosy at the same time as there was a major epidemic in Norway. In addition, wild armadillos from Louisiana, which are naturally infected with M. leprae, harbor the European/North African SNP type 3 strain, indicating that they were contaminated by human sources. 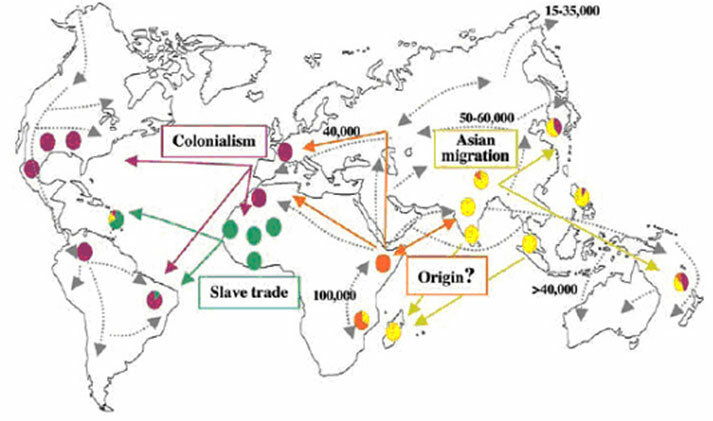 This hypothesis has been reinforced by subsequent research comparing medieval European M. leprae genomes with modern strains from around the world. This revealed “medieval European strains that are nearly identical to those now found in North America, both in leprosy patients and wild armadillos, thus suggesting a European origin of leprosy in the American armadillo population” (Schünemann et al). Interestingly, one island in the Caribbean shows evidence of all four strains of M. leprae: “It is noteworthy that the greatest variety of SNP types in the leprosy bacillus is found in islands such as the French West Indies and New Caledonia, reflecting the passage of, and settlement by, different human populations” (Monot et al.). In the sixteenth century, both the Spanish and the Portuguese were aware of the need to make some provisions for leprosy in their colonial possessions, as well as at home. To take the Spanish experience of the disease as an example: in Seville, the San Lazaro Hospital, established in 1248 and still caring for patients until the 1930s, served as a prototype for the Spanish leprosy hospitals in the New World. In the Spanish possessions, leprosy hospitals were established on the island of Hispaniola (1520), in Mexico City (1521), Lima (1563), Cartagena, Colombia (1592), Cuba (1617), Venezuela (1626), Argentina (1778), and in Louisiana (1776), when it was a Spanish possession (Toral and Lopez Dias). Throughout this region, there were clusters of the disease reflecting waves of colonisation. An epidemic of leprosy occurred amongst the small community of French immigrants in Tracadie, New Brunswick, Canada, in the mid-1800s. Some credit this as the source for the disease in Louisiana, as a result of migration of the French immigrants, although Louisiana was settled by the Spanish and the French (Gaudet). The Carville Asylum in Louisiana is historically important for many reasons, not least of all the beginnings of activism that brought about a change in the use of the derogatory terminology that people with the disease have suffered. Originally Indian Camp Plantation was set aside for a handful of patients in 1894 and for the Daughters of Charity of St Vincent de Paul to look after them. In 1905, it was purchased by the State and renamed the Louisiana State Home for Leprosy. In 1921 it became the National Leprosarium (the United States Public Health Service Marine Hospital No 66). It was renamed the Gillis W Long Hansen’s Disease Centre in 1984. People were sent there under the law until the 1960s. In South America, the presence of the disease was notable in Brazil and Colombia well into the twentieth century. Before the advent of the sulphones, it was scattered throughout most South American countries. In Argentina in 1938, the National Department of Health, reported 3,579 known cases. In Bolivia, there were 230 known cases in 1944. Chile reported no cases, although the Chilean government had turned Easter Island into a leprosy colony that reported hundreds of people with the disease in 1940. Ecuador reported 1000 people in 1944. The Guianas all reported a high presence of the disease. *2 While no survey had ever been conducted in Paraguay, 2000 people were estimated to have the disease. Peru and Venezuela reported no more than 3000 cases each in 1939, and Uruguay between 500 and 1000. Brazil and Colombia are most interesting for their history of dealing with leprosy. In Brazil, extensive modern colonia were constructed between the years 1931 and 1945, when compulsory isolation was introduced. Today, leprosy is still endemic in Brazil. By 2011 all the countries of the Region reported less than 1 case per 10,000 inhabitants, with the exception of Brazil (1.51). In Argentina, Bolivia, Dominican Republic, Paraguay and Venezuela, there were pockets where prevalence was higher. Brazil renewed its commitment to reduce the prevalence of leprosy as a priority with its National Plan for the Elimination of Neglected Infectious Diseases. In 2013, more than 33,000 new cases were reported in 24 countries of the region, the vast majority of them in Brazil. The number of new leprosy cases in the Americas fell by 36.9% between 2003 and 2013—from 52,435 to 33,084—according to the latest data of the Pan American Health Organization/World Health Organization (PAHO/WHO). Nearly 94% of these cases were reported from Brazil. The proportion of people with leprosy declined 54.2% at the regional level during the same period, from 0.72 to 0.33 cases per 10,000 inhabitants. Numbers have fallen significantly since then, but people are still being infected. Marc Monot, Nadine Honore, Thierry Garnier, Romulo Araoz, Jean-Yves Coppee, Celine Lacroix, Samba Sow, John S. Spencer, Richard W. Truman, Diana L. Williams, Robert Gelber, Marcos Virmond, Beatrice Flageul, Sang-Nae Cho, Baohong Ji,1Alberto Paniz-Mondolfi, Jacinto Convit, Saroj Young, Paul E. Fine, Voahangy Rasolofo, Patrick J. Brennan, Stewart T. Cole, “On the Origin of Leprosy”, Science 308 (May 13, 2005): 1040-1042. Michelle T Moran. Colonizing Leprosy: Imperialism and the Politics of Public Health in the United States, Studies in Social Medicine, (Chapel Hill, University of North Carolina Press, 2007). World Wide Distribution and Prevalence of Leprosy, Supplement to International Journal of Leprosy 12 (1944).